Leave your sense of humour at the door. 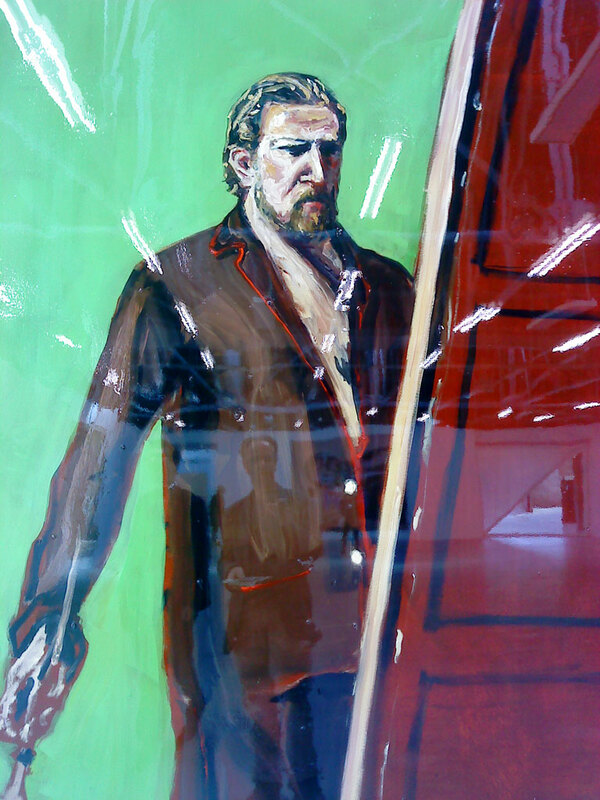 I went to see Julian Schnabel at The Dairy a couple of weeks ago. It is his first UK show for a little while. I had no idea about the show: I was only tipped off when I happened to look out of my window and see the unmistakable form of the man himself, somewhat portly nowadays, gallantly opening the door for a very elegantly dressed woman to get into a giant black Mercedes. His trousers were mostly rips and I’m pretty sure I saw paint stains on his jumper as he climbed in to join her. More than anyone else, he still manages to make being an artist seem like a glamourous life. When I first walked into the Boundary Road Saatchi gallery in 1985 I scarcely thought that one day all London galleries would be that way – huge, white and spacious – but that is what seems to be happening. The 12,800 square foot space at The Dairy is just one more cavernous space devoted to contemporary art. But if anyone can fill 12,800 square feet of gallery, it’s Julian Schnabel. He has always been a divisive figure though. He is a prince among artworld stars reviled by traditionalists. He personifies the suspicion that everything new in a gallery is a confidence trick perpetrated by cynical sophisticates on the gullible wealthy. When that sacred trust of the audience in its artists evaporated completely the thread of understanding was dropped: we were plunged into darkness. And the thread has remained lost. I struggled to make sense of this journey into (for me anyway) uncharted waters of ironic ambiguity and detachment I was fortunate to have an experienced guide on hand – Richard Guest of the very distinguished The Future is Papier Maché – who among his many other talents is a gifted interpreter of the obscure and peverse. You can read his account of it all here. 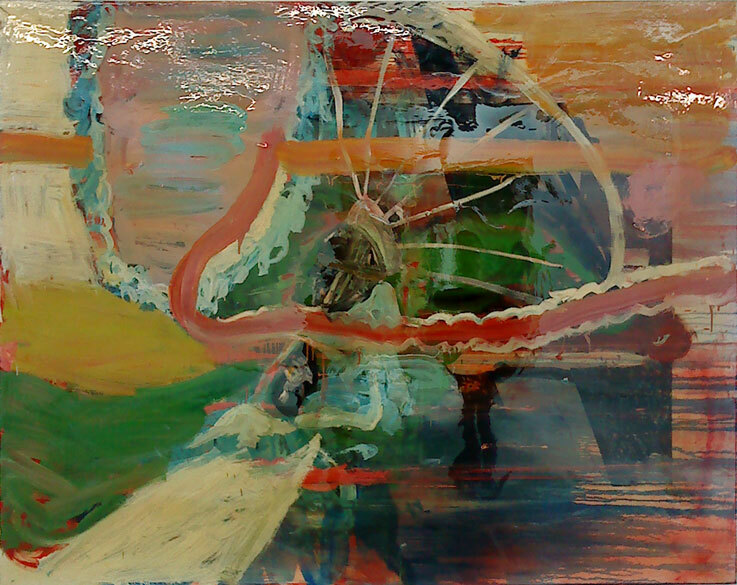 This show seems to be a return to painting, but without the plates. My first thought on seeing the giant self portraits was: is he trying to convince us that he is a painter, or is he trying to convince himself? Is there a very un-Schnabel-like scintilla of doubt in the lumpy drawing and clay like paint handling? I do not think he has solved the perennial problem of what to do when you are an enfant terrible who is no longer an enfant but is still terrible… I don’t like his work, but I cannot entirely dismiss it. Partly I don’t like it because I find it ugly – but then some people find de Kooning ugly. Some of the surfaces he creates have interest, and with Richard’s help though I was able to dimly perceive the paintings in a new light – a sort of unpremeditated (or artfully crafted) naive slice of his mind’s eye, of the interference in his brain, of his inablitity to draw and his infatuation with glossy and irrelevant surfaces. In an interview I saw (here) he made a reference to viewers with no sense of humour about painting. He was describing me. The camera panned around to paintings adorned with the name of Bez (of the Happy Mondays) over a printed image from (I guess) Hare Krishna literature. I was unamused. These Bez references are a red herring – a meaningless echo of a misappropriated culture. Unless we in London are like Gaugin’s Tahitians, staring blankly at our own image and unable to recognise ourselves in it. Even when it’s our own reflection in the high gloss varnish. 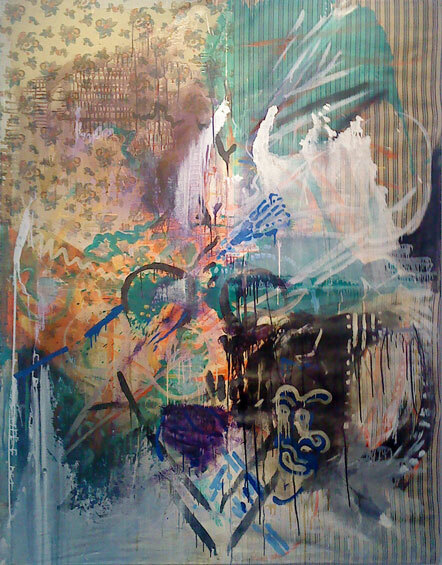 Looking at Polke’s work (as I will in my next Eyeball post) from the last two decades of his life which was clearly so inventive and sensual it feels as if Schnabel did nothing but break a few plates. Some of Schnabel’s paintings feel like cover versions of songs dubbed into the wrong language. Confusing. Aesthetic elements are present but all meaning has been lost. Or thrown away. Either he was good all along and he still is and I was just too blind to see or he was crap all along and he still is. Or he was good once but now he’s crap or he was crap before but he’s getting better. Is he any good? Was he ever? Is he getting better? Worse? Does it even matter? Who can tell? His appeal still eludes me. This entry was posted in American, Art, Galleries, Painting, Uncategorized and tagged 1980s, American, Art, Dairy, Galleries, Julian, London, Painting, Schnabel. It was great to see you, Dave. I really like your take on the show (and the self-portrait within a self-portrait) – it’s funny that we have such different takes on it. And thanks very much for the mention!